Ms Patel as Interim Prime Minister with Boris as Chancellor and UK Foreign Policy by Trump & Netanyahu? OMG! 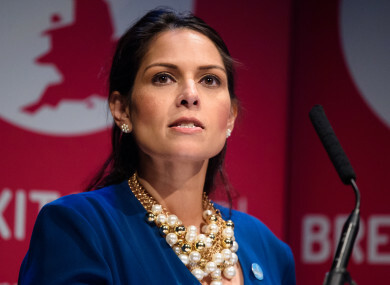 Would you pick as Conservative Party leader an ex-cabinet minister who was forced to resign from the Government because of her alleged disloyalty in November 2017, just less than 18 months ago? An ex-minister who reportedly tried to arrange for British tax monies to be covertly sent to Netanyahu’s IDF, in order to help fund Israel’s continued illegal occupation of the Golan Heights, the West Bank and East Jerusalem in direct violation of UN Security Council Resolution 2334 and the stated policy of the British government. Would you allow a nuclear-weaponised state in the Middle East to arrange for one of its lobbyists to become leader of a major British political Party and interim Prime Minister of the United Kingdom! The mind boggles at the thought! She would presumably invite the Israeli Prime Minister, (currently facing serious corruption charges), to officially visit Downing Street and be given the opportunity to address the House of Commons on Israeli government plans to illegally annex the Occupied Territories thereby making millions of Palestinian Arabs stateless, and further destabilising the entire region. She would probably appoint Boris Johnson, the bumbling court- jester, as her sidekick and Chancellor notwithstanding his former abject failure in Cabinet. The safest course of action, without doubt, would be for the Parliamentary Conservative Party to ensure that any of its MPs – other than ex- ministers Patel, Fox or Johnson – would become its interim leader. The British people are certainly not proposing to leave the EU merely to become a poodle for Team Trump and family. Can you imagine the nightmare of Trump, Netanyahu, Johnson & Patel? God help us!